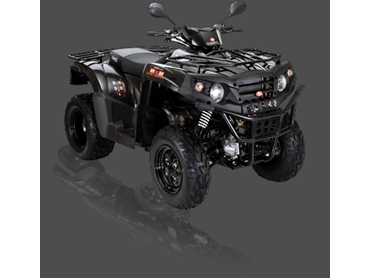 Aeon Australia ’s Crossland is also available in 4x4 ATVs model, powered by the same reliable liquid cooled four stroke engine as its two wheel drive brother. The 4X4 ATV Crossland has seen Aeon engineers build a mid size ATV that will go places that many heaver and larger quads struggle to go. The 4X4 ATV features increased grip through its four wheel drive that can switch back to two wheel drive by simply flicking a button on the dash. The smooth power that Aeon has built into the Crossland’s shaft driven 4x4 ATV has been designed to give maximum traction when tackling slippery conditions or terrain that is steep and rocky. In two wheel or four wheel mode the three speed CVT transmission is easily operated by a leaver next to a large 17.8 L fuel tank, with low speed being idle for spraying, climbing hills or towing. The Crossland 4x4 ATVs is quipped with a large front nudge bar, front and rear racks, good ground clearance, front and rear disc brakes and a large comfortable seat.